On Saturday 12th August, 2017 at about 9:10 pm acting upon information received of a shooting incident. San Pedro Police visited the San Pedro Town Poly Clinic II where they saw (3) three male persons suffering from gun shot wounds, identified as one 9 year old student of San Pedrito area, who received a gunshot wound to his left wrist, one 12 year old student received gunshot wound to his right side of buttocks and Lloyd Tyndall 27 years, farmer of Dump area, Toledo who received (3) gunshot wounds to his left side of abdomen and (3) to his left leg. Investigation reveals that on Saturday 12/8/17 sometime around 9:00 pm the victims were in the yard of Easy Does It A&A Wood Work Shop in the San Pedrito area, when two gunmen wearing black T-Shirts with dark/blue rags covering their nose and mouth came in front of the establishment and fired several shots towards the crowd. All three victims were later transported to the KHMH for further treatment. Two of the victims who are minors were in a stable condition and the other an adult was in a critical condition. Police have detained two persons as investigations continue. Police have charged a 21 year-old San Pedro resident for a weekend shooting on the island which left an adult in critical condition at the hospital, and 2 minors injured. He's this man, 21 year-old Christian Espat, a resident of the San Pedrito area, and reports to 7News are that he has caught the attention of police before. 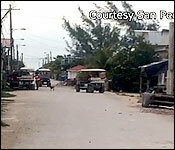 It happened on Saturday night just after 9:00 in the San Pedrito area, which is also where the main suspect lives. 27 year-old Lloyd Tyndall, a resident of Toledo, was at the "Easy Does it A&A Wood Work Shop." Also with him in the yard at that time was a 9 year old boy and a 12 year-old boy. And that's when 2 gunmen, who were wearing rags covering their nose a mouth, ran into the yard and opened fire. It is not clear who the intended target was, but the 27 year-old Toledo resident was injured by 3 shots which hit him in the abdomen, and another 3 shots which hit him in the left leg. In the spray of gunfire, the 9 year-old student suffered a gunshot to the left wrist, while the 12 year-old suffered an injury to the right buttocks. 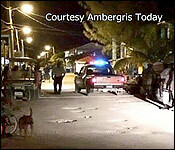 "On Saturday, the 12th of August, we had a shooting on the island of San Pedro at about 9 p.m., where one male person was shot along with 2 minors. They were socializing or hanging out in a premises when 2 male persons passed by and fired several shots. The male person, adult, who is Lloyd Tyndall, 27 years-old, received 3 gunshot wounds to the left abdomen, and 3 to the left leg. The 12 year-old minor received one gunshot wound to the buttocks, and a graze to the left leg. The second minor received a gunshot wound to the left forearm. We have not established any motive at this time. Nevertheless, we have 2 persons of interest in custody who we are looking at." "Do you or the investigators have any idea as to who was the intended target, in a shooting where 2 minors were injured?" 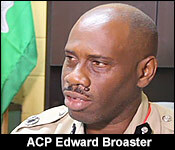 "Like I said, we haven't been able to establish the motive of the shooting as yet. So, it is difficult for us to establish who the intended target was or is. Nevertheless, Saturday night, we dispatched members of the Gang Suppression Unit to the island, and we will be beefing up and adding additional personnel on the island to ensure that the level of shooting that had transpired in San Pedro, couple years ago, does not re-occur." Police report that 27 year-old Lloyd Tyndall is in a critical condition at the hospital. 21 year Christian Espat has since been arrested and charged with 2 counts of attempted murder 2 counts of dangerous harm, and 3 counts of use of deadly means of harm. Police have transferred him to Belize City, and it is expected that he will be arraigned at the Magistrate's Court tomorrow. Our colleagues from the San Pedro Sun Newspaper report that he is related to the Espat family on the island, who also live in the San Pedrito area, and who have lost 6 male family members to gun violence over the last 8 years. 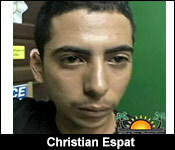 Alleged San Pedro shooter, 21 year old Christian Espat was arraigned and remanded to prison yesterday in Belize City Magistrate's Court. Espat appeared before Magistrate, Carlon Mendoza at around 4:15 p.m., and was read seven criminal offenses. He was charged with two counts of attempted murder, three counts of use of deadly means of harm with a dangerous weapon, and two counts of dangerous harm upon primary school students, aged 12 and 9, along with 27 year old Lloyd Tyndall. Espat was supposed to have been represented by well-known attorney, Dickie Bradley who said he didn't know that his client would have been taken to court late yesterday evening without his knowledge. He said he is making arrangements for a bail application for Espat which is expected to be done as early as this Friday. On Saturday night on the san Pedrito Area of San Pedro the three males were shot at A Woodwork Shop, when a lone gunman opened fire on them. Tyndall was severely wounded as he was shot as many as four times, while the 9 year old boy was shot to the left wrist and the 12 year old was shot in the right buttock. After being remanded to the Belize Central Prison for two counts of ‘attempted murder’, two counts of ‘dangerous harm’, and three counts of ‘use of deadly means of harm’, San Pedro resident, 21-year-old Christian Espat has been released on Supreme Court bail. Espat’s attorney, Dickie Bradley was able to secure his liberty at a bail hearing before Justice Adolph Lucas, who released him on $10,000 bail. Espat is expected to appear at the San Pedro Magistrate Court on November 24, 2017. There was a strong opposition from Crown Counsel representing the office of the Director of Public Prosecutions, who objected the bail. Crown Counsel Jackie Willoughby had submitted that he had been positively identified by a witness. Willoughby told Justice Lucas that one eyewitness had identified Espat at a police identification parade. However, Lucas considered the submissions from the Crown Counsel and statement of the eyewitness poor, and therefore granted bail in the sum of $10,000. The bail was granted under the conditions that Espat appears before the Magistrate Court on the island and on any other day the magistrate so orders him to reappear in court. Also, he is to report to the San Pedro Police Station, every Friday between the hours of 7AM and 6PM, until the charges are dismissed. 4 shootings and 2 murders since July?